Fifty years ago, an unknown killer terrorized Glasgow. His clean-cut visage, an artist’s impression from witness statements, stared from newspaper front pages. ‘Bible John’ butchered three women after they'd enjoyed nights out at a local dance hall, and left the police chasing smoke. 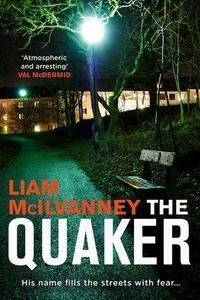 Literary professor and award-winning novelist Liam McIlvanney explores the effect of those killings on his home city in THE QUAKER, a novel with strong echoes of Glasgow’s real past. He shows a deft touch for character and setting throughout this absorbing, atmospheric read which uses a lightly fictionalised version of the Bible John killings as a launch-pad for a textured, nuanced novel. DI Duncan McCormack is the man tasked with sorting out the long-stalled investigation into the murders of three women. He’s parachuted into the ‘Quaker’ investigation after recent success in the elite Flying Squad, with instructions to work out what’s gone wrong and why the Quaker hasn’t been caught. It’s a test for the fast-rising copper from the Highlands, and a poisoned chalice. His new colleagues are tired, frustrated, and dislike him on sight, the bosses are demanding certain outcomes for political purposes, and throughout it all he’s harbouring dangerous secrets of his own. A sense of dread still hovers over the city, even as months have passed since the last killing. Could it be over? McIlvanney has created a really interesting main character in McCormack, but this novel is about much more than a singular detective trying to track an elusive serial killer, while dealing with internal politics and outside pressures. It's a superb tale with a vivid sense of time and place. 1960s Glasgow was a different era, but McIlvanney also brings some modern sensibilities, perhaps, by giving the female victims a strong voice, rather than merely being inert props for the male cops and criminals. THE QUAKER is an evocative slice of the past that’s populated with an array of intriguing characters, tough issues, and some nuanced interplay between them. McIlvanney may call himself a 'slow motion crime writer', but he certainly ensures his books are well worth the wait.